Chimpanzee Tea Party: WoW: Mai kitteh form can has hardo!? There will be five different designs for each of these forms for the Horde and Alliance. 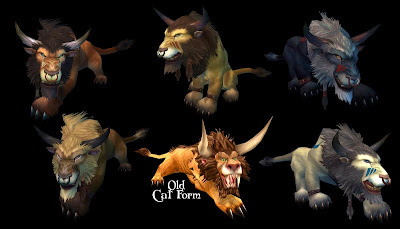 Night elves can choose to change their cat and bear look at any time by visiting the barber shop and changing their character's hair color, while tauren will be able to change which look they use by switching skin tones in the barber shop -- a new feature for tauren in the next major content patch. It would be somewhat cooler if you could change the look of your cat/bear forms independently, but still it's a nice touch.